Composer. Poet. Conductor. There doesn’t seem to be much that Medfield’s Matthew Aucoin can’t do. 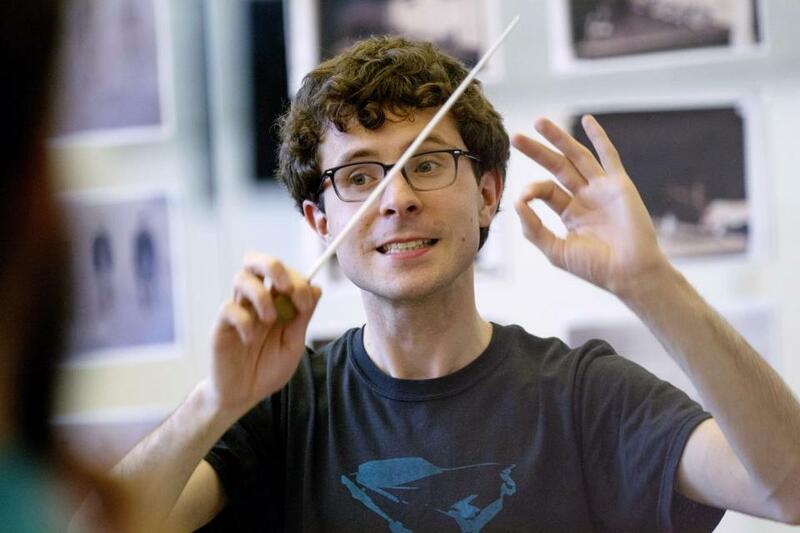 NEW YORK — When it comes to opening-night jitters, few tales can top Matthew Aucoin’s debut conducting the Chicago Symphony Orchestra. 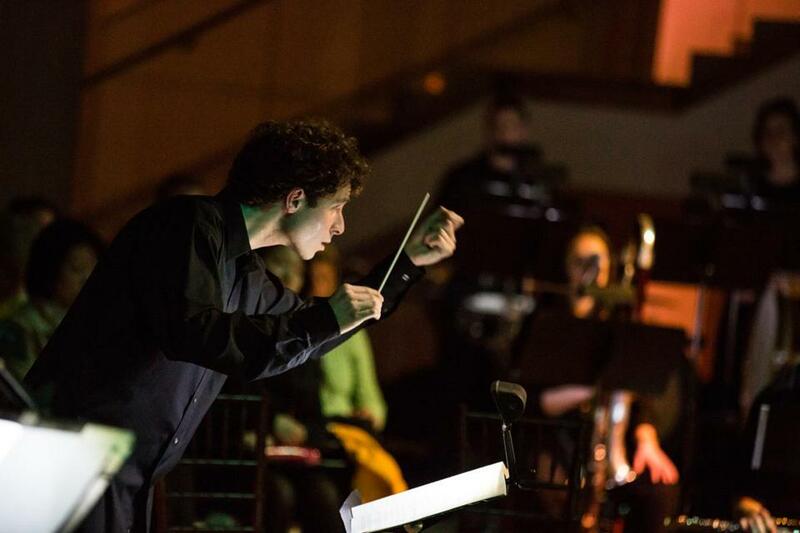 It was February of last year, and Aucoin, a conducting apprentice with the orchestra, had been tapped to fill in for the legendary French composer and conductor Pierre Boulez. The program called for challenging works by Stravinsky and Ravel. To lessen the audience’s disappointment at Boulez’s absence, it also included a massive video projection overhead, through which the towering maestro held forth on the works, introducing them to the audience. But if Aucoin was nervous, he didn’t let it show. Still boyish at 25 with a mop of brown hair, the Medfield native is quickly making a name for himself in classical music’s upper echelons as a rare triple-threat. In addition to his conducting duties in Chicago, where he serves as the Solti Conducting Apprentice, he has also worked as an assistant conductor at the Metropolitan Opera in New York. A skilled pianist as well, he holds his own with symphony-level musicians, having shared the stage with members of the Chicago Symphony and Metropolitan Opera performers. But Aucoin’s foremost passion is composing. At the Peabody Essex Museum in Salem, he serves as the composer-in-residence, and he has been named to an early-career musician residency at Dumbarton Oaks in Washington, D.C., next year. Matthew Aucoin conducted a performance at Salem’s Peabody Essex Museum, where he is the composer in residence. At present, he has commissions from the Los Angeles Chamber Orchestra and Carnegie Hall, among others, for new works to be performed next season. And over the past few years, he’s had theatrical works commissioned by the Lyric Opera of Chicago, the Metropolitan Opera/Lincoln Center Theater New Works Program, and the American Repertory Theater in Cambridge, which later this month will premiere “Crossing,” his opera based on Walt Whitman’s Civil War diaries. These days, however, Aucoin can be found in one place: an Upper West Side rehearsal studio, where he’s carefully rehearsing the New York-based cast through “Crossing,” his first professionally produced opera. Of course, some of those heads were of Aucoin’s own making. When he wrote “Crossing,” which explores Whitman’s experiences while working at a hospital during the Civil War, he conceived it as an ensemble piece, with Whitman wandering, Dante-like, through a purgatorial landscape, populated by soldiers from across the ages. The work received positive feedback during a workshop last year. But Aucoin wasn’t satisfied. In the months that followed, Aucoin scrapped huge sections of the original work, which he calls “the stupidest and best decision I’ve ever made.” He “ruthlessly murdered” several smaller characters, focusing instead on an ambivalent love story between Whitman and one of the soldiers. The son of Globe theater critic Don Aucoin (who does not cover the ART) and his wife, Carol, Matthew came to music early — “I was totally that insufferable classical kid” — playing from memory Mozart’s entire opera “The Marriage of Figaro” at the piano when he was 11, and presenting his first symphonic work during a semiprofessional concert at the Rivers School Conservatory when he was 9. There, when the conductor gestured for him to stand at the end of the concert, the young Aucoin had to climb on a chair for the audience to see him. “Everyone just gasped,” recalled his father. Aucoin briefly stepped away from classical music during high school, joining a rock band with friends, and exploring jazz. But symphonic music soon beckoned him back. 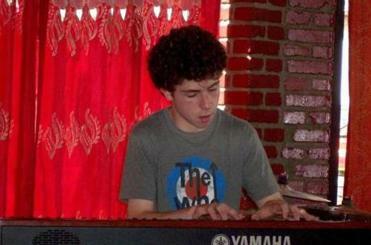 Matthew Aucoin journeyed into playing rock music during his teenage years in a band with his friends. But music never released its grasp, and Aucoin spent his spare time in college playing with other musicians, conducting, and composing musical works of his own, including an opera based on the poet Hart Crane. Produced in 2012 during his senior year, the opera caught the attention not only of Paulus, but also of the famed soprano Renée Fleming, whose daughter was in the production. Aucoin had had a similar stroke of good fortune only a few months earlier, while conducting Harvard’s Dunster House Opera in a student production of Mozart’s “The Marriage of Figaro.” Since the production was mounted in one of the school’s dining halls, cast and crew had to replace the furniture following each performance. Within weeks, Aucoin was in New York to audition for the company’s young artists training program, a “torture audition” for which he had to play an entire act of an opera on the piano, sing all of the parts, and coach other singers. By the end of the audition, the Met didn’t want Aucoin to join the training program; they wanted to hire him, making Aucoin, at 21, the youngest assistant conductor in the company’s history. “He’s obviously remarkably gifted — he’s too old to be a child prodigy, but it seems to be an extension of what he was as a child prodigy,” said Gelb. Meanwhile, Aucoin was also studying composition at Juilliard, and Paul Cremo, the Met’s dramaturg, said that word about Aucoin’s work as a composer was getting out. Aucoin was already in discussion with the ART when Cremo visited Juilliard to hear some of his poetry settings. Like Whitman, however, Aucoin contains multitudes. His work is still evolving, and he says that “Crossing,” which he began writing at 22, isn’t necessarily representative of his work today. Composing, Aucoin explained, is like “making a map” of the night sky. He’s finding hidden stars and charting constellations. He’ll sense that a certain note, or a certain chord wants to land at a precise place in the score. Matthew Aucoin rehearsed the cast for "Crossing," a new Whitman-inspired Civil War opera opening at the ART. In “Crossing,” Aucoin said, he was fascinated by the larger-than-life figure of Whitman and the questions the poet’s life and persona raise about unconditional love, the worth of art, and how we retain our individuality during a time of mass atrocity. Nevertheless, strains of Whitman filled the warm spring air recently as the composer worked with the baritone Rod Gilfry and tenor Alexander Lewis at the Manhattan Movement & Arts Center. The singers were working their way through the difficult score, a work by turns shimmering and resounding, marked by constantly shifting time signatures. Surrounded by prop hospital beds, period bottles, photographs, books, and crutches, the performers had been at it for an hour. The wall behind Aucoin displayed pictures of Whitman, mock-ups of the set, and period costumes. Meanwhile, Aucoin homed in on the moment Lewis’s character, Whitman’s would-be love interest, John Wormley, first deceives the poet. “You’re formally singing a lie that’s almost sickly sweet. Sell it,” he said, sitting straight up on a backless stool. As Lewis ran through the passage again, a smile began to spread across Aucoin’s face as the music in the air began to align with the constellations in his head — rich star maps that have the classical music world buzzing, drawing comparisons with many of the form’s titans. With so much attention being lavished on him, that buzz threatens to become deafening — a distraction he’s trying hard to avoid. 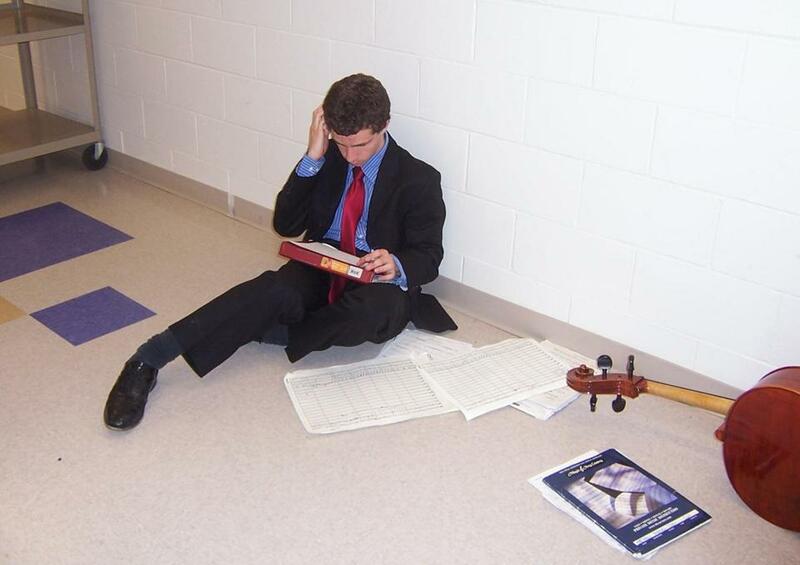 Matthew Aucoin revised a score backstage during a 2007 performance. At: Citi Shubert Theatre, May 29-June 6.